A turning point in our country's history, when the colonials decided, even though the odds were against them, to fight for freedom, for independence. War started a year later, and in 1776 The Declaration of Independence was signed by men who believed in God. New Mexico was still apart of Mexico in 1824, it was life filled with cattle ranches and the desert sun, but in the years to come it would become apart of this great country. People from other countries were coming to America to find a better way of life. The long journeys were hard, and so was starting over somewhere new. But they followed their dreams to find freedom. 1904 was a time of great change in America, The Industrial Revolution was running strong, and the invention of the assembly line had changed the production of goods forever. Homes had electricity and women were fighting for the right to vote. The country was changing in ways many people could have never imagined. The Great Depression had started, and it was one of the most difficult times that has ever hit the US. Many people lost everything, but it made them thankful for what they did have. The world had gone into a war, and Americans did everything they could to help the war efforts. It was a very patriotic time in our history when everyone was taking part to win the war. World War II was over, but a new threat was on the arise with the Cold War. It was a very scary time for a lot people, they were building bomb shelters in their yards and preparing for the danger it might bring. But thankfully it passed safely. They were all apart of making our country what it is today. And what we did in the past is just as important as what we do in the future. God blessed us with a place with so many freedoms, never take them for granted. Always pray for those brave men and women who fight to protect you and your freedom and if anyone who has been in the military is reading this than thank you SO much for your service! WHAT!?!?!? Not historically accurate??? Why did you let me down!?!??!?! I do love Saige's outfit though...did you hand sew it? Thanks so much Jewel! I ment to get this out yesterday, but I ended up doing some stuff with my dad and I just started Smile direct club invisible aligners so I was I a ton of pain XD oh no problem! I hope lots of people go and follow you! You're welcome. :) Ooooh man... ouch. Aww! Thank You! Katie, Avery’s dress is sooo cute!!! I had no idea you could sew that well!! The photoshoot is darling, great job! I would totally buy that! Thank you soooooooo much Madison! That means so much to me <3 I've been trying to better my sewing skills for a while and I was pretty happy with the way they turned out. Thank you! Wow! Since you were 6? That’s a while! Everyone looks wonderful! 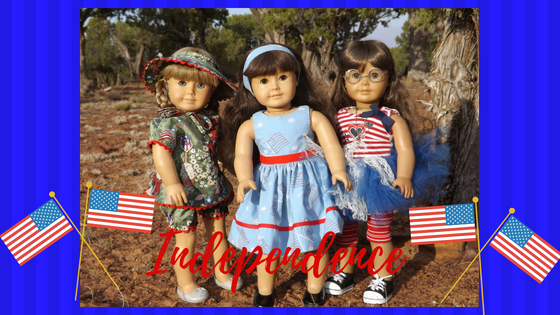 The best part is they are free to choose their outfits for celebrating Independence. :-) Great post!